I am so pleased to be one of the few bloggers sharing this with you today. Strange Chemistry want to show you one of their amazing new covers which will be published in October. Isn't it gorgeous! I absolutely love this cover! It is a YA fantasy, but considered to have a huge crossover appeal into an adult audience. Here is the official blurb about the book. This novel has echoes of Scott Lynch, Saladin Ahmed and Tamora Pierce. It has a defiant Arabian Nights feel to the story and is all round magnificent. Many of you will have heard me nattering on about Strange Chemistry's Open Door period, well Cassandra Clarke's manuscript was chosen during the Open Door month with Angry Robot last year. Here is a some more information about the author. 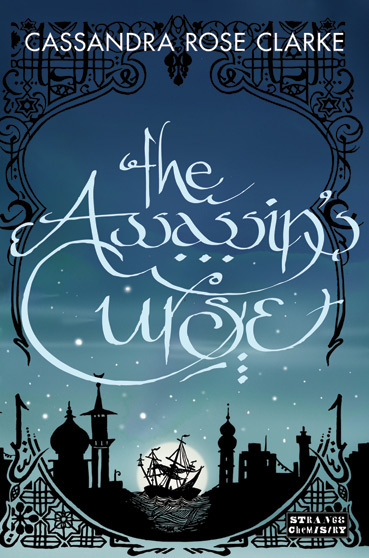 To celebrate the revealing of this gorgeous cover, Strange Chemistry want to give you all the chance to win an ARC copy of The Assassin's Curse. How would you like to read it before anyone else? Well all you have to do is leave a comment about the cover and leave your email address at the bottom. This is a UK only competition, but I have been assured that there are a couple of American bloggers offering the same prize. A winner will be chosen at random on the 9th May. What are you waiting for? Oooh, that looks great! Love the font and the boat. Reminds me slightly of Shadow and Bone, which can only be a good thing as that's one of my favorite recent covers. Wow, that looks really interesting. I'm really loving the cover, it's very artistic. It definitely shows that the creator used imagination and really worked on it, instead of just using a stock photo. I really wish I lived in the UK lol But good luck to those entering to win. I'll surely put it in my TBR list. The synopsis had me from the word pirate :D This sounds like a great YA fantasy, thanks for the heads up Vivienne. Good luck to all the UK readers entering the giveaway. It is indeed a gorgeous cover, the kind that would certainly have me picking it up if just for this reason. What a wonderful looking cover also sounds a really interesting book to read with a mix of pirates and magic two of my favourite things. That is a great cover and the book sounds good as well! I'll keep an eye out for it. I love this cover, The book sounds awesome! I would love to read this! Not only does the story sound amazing, but the cover is beautiful. I love the Arabian influence on the font! I would love to read this! Not only does the plot sound amazing, but the cover is beautiful. I like the calligraphy design. I love the cover! The colours and silhouette reminds me of Paris artwork. You often see that style of art in their postcards and such. Thanks so much for the giveaway! I love the cover background and Aladdin style writing. Thanks for uk only giveaway. I love the use of colors and the boat it looks awesome. 4. I need to read it!!!! Thanks for the opportunity to win and for highlighting the book! Great giveway! Beautiful book cover with very unusual Arabic font.... so pretty!